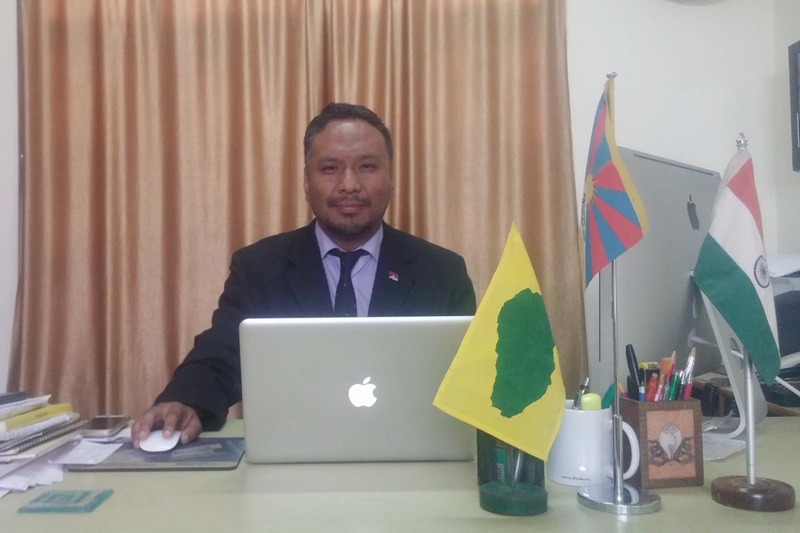 The largest and most active exile Tibetan organisation, the Tibetan Youth Congress, landed in major trouble in 2013 after eight of the 88 regional chapters withdrew. Then another chapter, New York/New Jersey, was temporarily dissolved, plunging the organisation deeper into controversy. The cause of the trouble was conflicting items in the aims and objectives of the organisation, namely the first and the fourth clauses. Clause one says: To dedicate oneself to the task of serving one’s country and people under the guidance of His Holiness the Dalai Lama, the Spiritual and Temporal Ruler of Tibet. Clause four says: To struggle for the total independence of Tibet even at the cost of one’s life. The Dalai Lama had proposed the idea of the ‘Middle-Way’ policy in the 70s, and officially declared the proposal in the European Parliament in Strasbourg in 1988. As a result of an opinion poll in 1997, the Central Tibetan Administration adopted the Middle Way as the official policy to resolve the Tibetan issue with China through dialogue and non-violence, settling for autonomy rather than independence for Tibet. In May 2013 the eight regional chapters demanded a discussion on TYC’s aims and objectives in their general body meeting, after the Dalai Lama earlier that year expressly stated that independence was not possible to achieve, and affirmed his full confidence in the Middle-Way Policy. The TYC executive members refused to have a discussion, which led to the crisis. The executive members toured South India earlier this month to try to reconcile with the renegade groups. But it’s not clear what the outcome was as the members were tight-lipped about the tour, and said more will come out in the near future. Tibet Sun asked TYC president Tenzing Jigme to explain the current situation of the organisation. TYC announced the termination of all the members of the New York/New Jersey Regional Tibetan Youth Congress (RTYC) in December, but they have refused to accept the order. What is the situation now? Are they still the RTYC New York/New Jersey? The situation of RTYC/NYNJ is that the chapter still remains a part of TYC Centrex. We have withdrawn the decision to close the chapter, and they have agreed to remain a part of our organisation and abide by all our aims and objectives. So yes, they are still RTYC New York/New Jersey. I am very pleased to inform you that new board members of 14th RTYC/NYNJ were elected in our (Centrex) presence back in January. The matter has been resolved and the official handover to the new board took place on 16 April. The members have claimed that their ouster by TYC Central was not according to the rules of the organisation. Why have they been ousted, and was their claim right about TYC Central’s disregard of the rules? I think we need to be clear that no one was ousted by TYC Centrex. We made a decision to temporarily close the chapter, but no one was ousted by us. At the 45th and 46th TYC Working Committee Meeting, the quorum had adopted a resolution giving Centrex the full authority to make decisions on the eight chapters in India as well as New York/New Jersey. So we have not broken any rules regarding this matter. There is growing demand within the TYC that clauses One and Four of the constitution of the organisation be reviewed, and a decision be made that either TYC follow the first clause and change the goal of TYC to ‘Middle-Way’, or remove the first and stick to Rangzen, as in the fourth clause. During the General Body Meeting in June 2013, eight RTYCs demanded a review of this issue. The demands were rejected by TYC Central, leading to the withdrawal of the eight RTYCs from the organisation. Now New York/New Jersey is asking the same about reviewing the two clauses. Why is this review not being done despite the calls? What is stopping TYC from doing a review? The first clause of TYC aims and objectives is to follow the guidance of His Holiness the 14th Dalai Lama. I believe that should be the aim or principle of every Tibetan. Our fourth clause is to seek independence for Tibet, which is our right. I don’t think we need to give up seeking our right. Since the inception of the Middle-Way Approach in 1980 until now, over the last forty years we did not have any issues. TYC’s charter was formed in 1970. Both political stands have co-existed in the past without any problems. More importantly, what I really think needs to happen in our exile diaspora is that we need to comprehend ongoing discussions in our political discourse, and pay attention to elements that seem to be intruding into our society and our communities to divide us vis-a-vis Rangzen vs MW or Regionalism or Sectarianism. We have eighty-eight chapters under our organisation. A few chapters have made demands to review or change our core aims, but like in any democratic organisation, for changes to take place it must happen according to the organisation’s rules and regulations. All articles of TYC’s charter can be reviewed and even amended through a process. If a majority of TYC chapters call for an article to be amended, then we as Centrex have to listen to their demands and bring that amendment to a discussion and ultimately vote on that new resolution at our General Body Meeting, which is the highest decision-making body of TYC. So we have always said that if you want change in TYC’s Charter, then you need to be a part of the process for change, and then you have to respect the decision of the majority. Out of eighty-eight chapters, eight chapters want TYC to change its political stand. That’s not a majority. Among the eight chapters that had withdrawn from TYC, the four from South India form the biggest and most crucial chapters of TYC. Has their withdrawal caused any impact on the functioning of the organisation? The eight chapters made a decision in 2013 that they would not be under TYC Centrex. Since then we have made several appeals to them to resolve the issue. Yes, four of the chapters belong to the biggest settlements in our Tibetan community in India, but I don’t know if they are the most crucial. It really depends on how you look at it. However, every chapter and member is important to us and we do understand the need for the organisation to remain united. Therefore, we are seeking a path to where we can resolve the issue with the chapters who have withdrawn from being under Centrex. If we are not able to resolve the issue then we will make a decision on their status, as a resolution was adopted at the 2015 46th TYC Working Committee Meeting in Delhi, that Centrex needs to make a clear-cut verdict on the eight chapters as well as New York/New Jersey. TYC has been promoting itself as the NGO with the largest membership of any organisation in the exile Tibetan world. With the withdrawal of the eight RTYCs, what’s the difference in membership numbers between now and then? We are truly blessed to have such an organisation like TYC, which gives Tibetans the opportunity to serve our country and our people. There is a whole new generation of young Tibetans both in exile and inside Tibet that are committing themselves to our struggle like never before. TYC thus plays a very important role in organising, educating, and mobilising [our youth] to channel their resources, their energy, and their spirit towards strengthening the struggle for Tibet’s freedom and independence. Even though eight chapters have withdrawn from being under Centrex, there is no significant change in the membership of TYC as we have not received resignation of any individual members yet. As a matter of fact, I would think our membership has even grown stronger as we have witnessed younger Tibetans wanting to get involved in our struggle and be a part of this significant organisation — an organisation that China wants to see destroyed but which remains strong due to the spirit, determination, and courage of Tibetans to win their freedom back. The aspiration and resilience of Tibetans in exile and Tibetans inside Tibet for the freedom and independence of our nation is what will keep TYC thriving and our struggle alive. President Jigme is being naive. If all the South India RTYCs leave TYC, it must be the decision of all the members. So why would each member submit their resignation. If a government dissolves, would you expect resignation from all the ministers? South India has the largest Tibetan refugee community. Their exit must mean losing a lot of membership. Even if the President doesn’t want to consider the eight RTYCs to be a big deal, their withdrawal from the organization was because of the two contradicting clauses. Even if the President considers they are in the minority, their voices should be heard. On the contrary, the eight RTYCs, including the Ladakh RTYC (another big chapter), are an important and crucial part of the organization. At least a debate should have been allowed. Every TYC member has the right to his/her voice. It’s nothing to do with one or two people. In any case, by logical reasons change is but necessary to the Aims and Objectives, the two contradicting clauses should be changed. It’s plain truth that the two clauses are contradicting. His Holiness doesn’t have to be in TYC’s Constitution. He is no more the political leader anyway and he is being mentioned as the ‘temporal leader’ in the Constitution. He can be in personal prayers and beliefs, but doesn’t have to be in the organization. Be logical and realistic, if TYC wants to be seen as a viable and relevant organization in today’s time. And now add to the whole case the prophecy of Nechung saying that the Middle Way is the best way to bring a solution to the Tibetan cause. Will TYC ignore that too and will not have a debate? Time has come for debate, change and move forward. Anybody can disagree with His Holiness, but everybody should be respecting His Holiness. There has to be a reason why TYC exists in the first place. Both His Holiness and TYC wish for the well being of Tibetan people. Make sure good intention is always there. If TYC is not a political org. is it a religious organisation? knowing very well what the TYC stands for you come up with a statement like this. Can you guys for once just refrain from taking His Holiness’s name in vain, please. Just to remind you that His Holiness was our phenomenal political leader till 2011. He is still influential globally. Some seem to be fairly educated, yet lack in-depth knowledge or losing memories or simply being “whatever” towards His Holiness’ efforts and success. I wish our younger generation to do more research before jumping on the bandwagon.